Product Enterprises, the company behind the talking Daleks, has done it again. 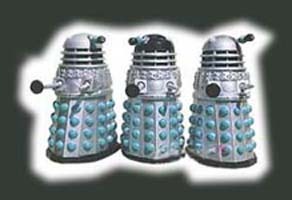 and this time their Daleks are probably even better. The four sets of Roll-A-Matics Daleks, each counting three of Skaro's finest in a different livery, are finely detail with moving arms, eye and head - as well as having a 'pull back and go' action. Each set of 65mm-high alien exterminators costs just £14.99 - every penny well spent. But don't go spending all your hard-earned at once as Product Enterprises is also releasing a talking Cyberman, Tom Baker and K9 over the summer.